It’s brutally hot here at Tumbleweed Farm. Hotter than it’s been all season long and we are feeling it. Chores are extra tough in this heat and we feel like we are moving through molasses as we chip away at the to-do list. Because it’s been so hot our appetites aren’t quite as strong and standing in my hot kitchen isn’t really an option right now. 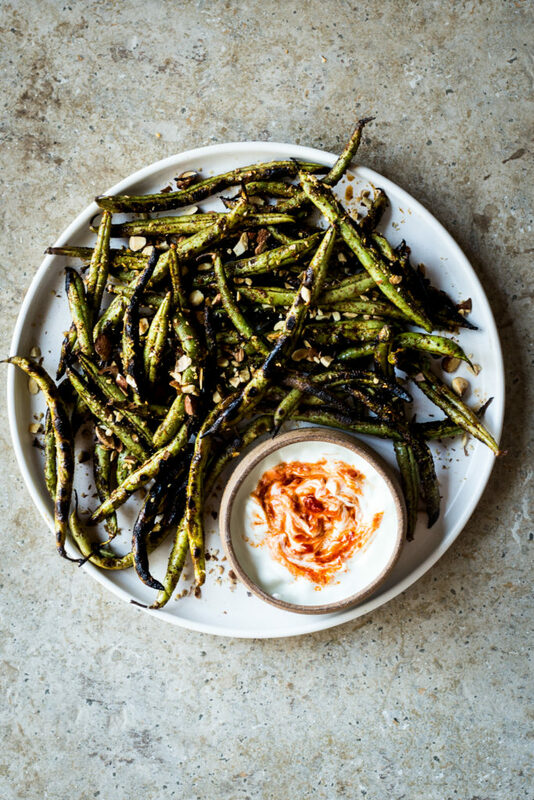 Luckily, the outdoor grill has been working like a charm and this recipe for charred green beans and harissa yogurt is just what our bodies have been craving. Simple, spicy and perfect for any summer gathering. This dish really blew our minds and I don’t think we’ll prepare green beans any other way for the rest of the summer. We tossed them in a spiced oil mixture and then lightly charred them on the grill. The harissa yogurt dip is wonderful and would be great served with any grilled or roasted vegetable. We thought our Kohlrabi Fries would taste good dipped in this sauce too. It’s versatile, delicious and I hope you all enjoy this simple side dish as much as we do. We served these spiced green beans with grilled hamburgers from our favorite ranch for a no-fuss farm dinner. Oil the grates of an outdoor grill and heat it to medium-high heat. In a large bowl mix together the honey, spices, oil, salt and pepper. Toss the green beans into the bowl and mix well, tossing to coat all the beans in the mixture. Set a wire rack or grill basket on the preheated grates (or carefully place the beans directly on the grates in a single layer, being careful not to let them fall through) and grill the beans until lightly charred, flipping once or twice while cooking, about 10 minutes. Remove the beans from the grill and place them back in the bowl that you mixed the oil/spice mixture. Lightly toss the beans and sprinkle them with the roasted hazelnuts. Whisk together all the ingredients for the yogurt sauce. Taste and adjust seasonings as needed. Serve the beans on a platter with the yogurt sauce and enjoy.